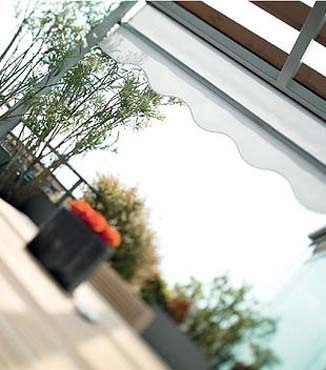 As the name suggests, Straight Drop Awnings operate with a vertical range of motion. Ideal for external windows, verandahs, patios and balconies, they provide a stylish solution for your shade and U.V protection. Our straight drop awnings in Melbourne come in a wide variety of models and looks, and include a choice of control options to make sure they function perfectly for your needs. Our Straight Drop Outdoor Awnings include models for traditional tastes, through to our premium Illios models with fully enclosed headboxes, side channels and guide wires. We understand that tastes may vary, and that’s why we offer hundreds of fabric colours to choose from. We also offer many different hardware and valance styles. Creating a product that is perfect for your home or business is possible at Blinds4Less in Melbourne. Our Straight Drop Outdoor Awnings are built tough to withstand Australias harsh conditions. We supply a 5 Year Warranty on all our outdoor awning products as testament to there quality. Proudly Made in Australia to Australian Quality Standards. Our awnings are made using state of the art manufacturing technology. It is also good to know you are supporting Australian Made. At Blinds4Less all our awning fabrics are cut with the latest laser cutting technology and fabric welders, delivering a squarer cleaner edge and reducing the incidence of fraying. Blinds4Less awnings are designed to withstand Australias harsh climate. We use only heavy duty and anti-corrosive components to deliver a superior and longer lasting outdoor awning. Our extensive range of outdoor fabrics gives you the flexibility in finding just the right colours to suit your taste. With Canvas, Acrylics and Screening style fabrics weve got every one covered. Get in touch for a FREE quote today!